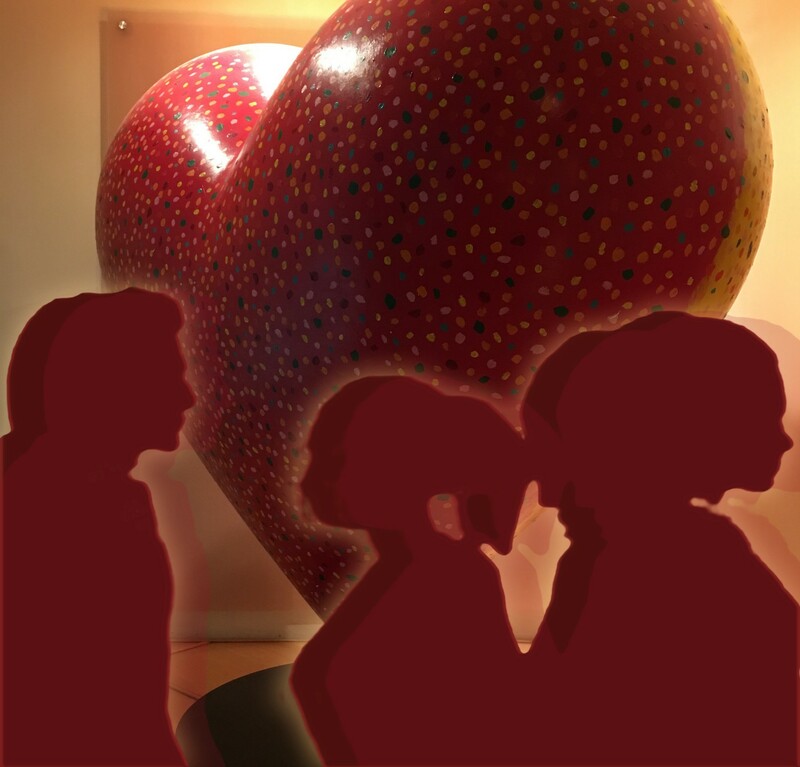 I know the big red heart just outside the hospital lobby is supposed to signify love, care and compassion, but this morning it’s just creeping me out — as do all the other hearts, seemingly everywhere. The nurses decorate the white boards in patient rooms with them. I saw some on the paperwork needed to get my husband from his hospital room to the surgery unit. The oversized heart, like the enormous eyeglasses on the billboard in The Great Gatsby, presides over this portal, where many like myself pass each day to see a loved one through a difficult complicated procedure that will wreck the body and dim the mind, and suggests each time I enter that I should pause to have an existential moment. Today the heart mocks the reality of my husband’s actual flesh-and-blood beating heart that soon will be paused, intentionally, while the critical tasks of circulation and respiration are assigned instead to a heart/lung by-pass machine. He will become, for the next few hours, what might be considered heartless. His vitals will proclaim he is alive, but he will not be fully human again until the heart/lung machine is disconnected and his own repaired heart resumes its beating. For the next few hours he and those attending him will be fully integrated into this vast hospital system where his starring role as anesthesized patient splayed out on the operating table depends on the ensemble cast surrounding him, a coordinated network of machines with dedicated jobs and trustworthy readouts, and medical talent with the quick hands, expert moves and sharp minds required to ensure success. This impressive performance, part human, part machine, is more than the sum of its parts. It’s deep, deft, cosmic, emotional, spiritual, digitally precise, properly caffeinated, and full of deep dives, sweaty brows and tense moments that are incomprehensible and terrifying to the one who is present merely to bear witness: me. My spousal job involves nothing more than waiting for my husband to open his eyes and begin the long process of becoming human again. Awake but not alert, verbal but incoherent, sluggish in all his systems from the meds and the sheer trauma his body has experienced. The gradual disconnect lasts for days, until the final tubes come out of his chest and the final circuits are removed. We will see more hearts. When he is fully unplugged and ready to be discharged, he will take an additional one home — the soft red heart-shaped pillow all heart surgery patients receive to hug as they cough, turn and sit up, designed to keep the fragile work done inside the chest intact while it heals. When we leave, we will pass by the big red heart in the entryway and I will see the big heart for what it really is: a cartoony cliché inexplicably decorated with tiny polka dots, a questionable purchase of public art to be admired or merely tolerated, dependent on one’s aesthetic tastes. Keep moving, the heart says to me. Nothing existential to see here. But just outside, there’s a woman in a wheelchair waiting for her ride. She’s clutching her swaddled newborn to her chest in the crisp winter afternoon. The infant’s tiny heart that beat so fast in the womb is now pacing itself for a long trek through a life that’s just beginning and whose end is nowhere in sight. Thank you, big red hospital heart, for giving me pause. Just as the giant eyeglasses of Doctor T. J. Eckleburg on the road from New York to Long Island may be seen as both a billboard advertisement and a visual commentary on the human condition, so is the big red heart both hospital decor and a potent motif strategically positioned in the hospital entrance, where it offers each passerby the opportunity to reflect on one’s own reasons for entering or exiting, and on the much greater arena of beating hearts that lie on either side of this portal.